In order to assist NC MS for better and harmonized implementation of Roadside stations (RSS) program, the NCTTCA has been mandated to coordinate the regional roll out program. 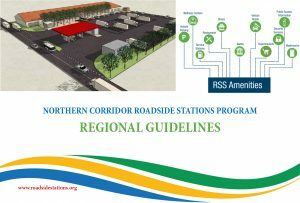 Moving forward, in September 2016, the Northern Corridor Transit and Transport Coordination Authority (NCTTCA), has developed a RSS Regional Guidelines that specify in details the RSS project implementation process while Northern Corridor Member States are requested to develop specific operations manual that are in line with their national policies. The development of RSS Regional Guidelines came as one of the directives from the NCTTCA Council of Ministers during the Policy Organs Meeting held in Mombasa, in June 2016. A fully implemented RSS will not only provide for rest stops especially for Cargo trucks aimed at reducing driver fatigue, will also provide secure parking yards and will be used by other motorists as refreshing stops. In addition, the rest stops will be used to address social economic dimensions in cross border trade including Road safety and Health related issues. It is therefore recommended that wellness centers to address cross cutting social dimensions be established alongside the RSS.